The ruby has a very long history. It’s even mentioned four times in the Bible. God created 12 stones, and the most precious one was the ruby. Hinduists used to call the ruby ratnaraj, which means “the king of precious gems.” In ancient times, people believed that if you put a ruby into water, it can make it boil, owing to the ruby’s internal fire. If you dream of rubies, it is said that a great success in business is coming your way. Thanks to its color, healers associate rubies with the circulatory system. It is said to strengthen the heart and that it has the ability to mitigate problems with vision. It has the closest connection to people born in the signs of Scorpio, Leo, or Aries. It helps them to live their lives in peace and in good relationships with others. Rubies are said to even protects houses and land from fires and other natural forces if the owner touches their house with a ruby in all four cardinal directions. 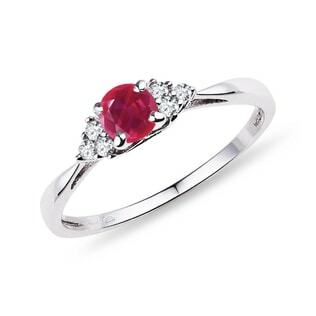 According to legend, if any danger threatening the owner of the stone is around, the ruby will turn dark, and it returns to its natural color when the danger is over. 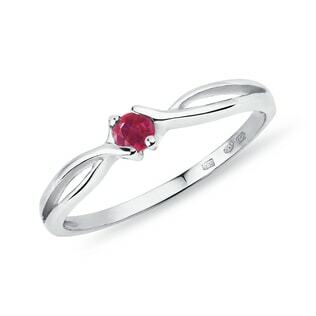 Rubies are also thought to have the ability to change negative energy into positive. As well as its blue sibling, the sapphire, the ruby belongs to the corundum family. It is the second hardest stone on the hardness scale, second only to the hardest stone – the diamond. From the chemical point of view, it is aluminum oxide, and it gets its hues from smaller amounts of other elements. 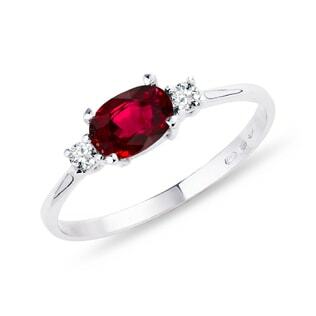 In the case of the ruby, the color is caused by chromium. Therefore, this gemstone can be found in the shades ranging from pink to red, depending on the amount of chromium in the stone. As it is so close in composition to the sapphire, scientists still argue whether pink corundum is a light-red ruby or a pink sapphire (among KLENOTA jewelry, you’ll see them termed pink sapphires). 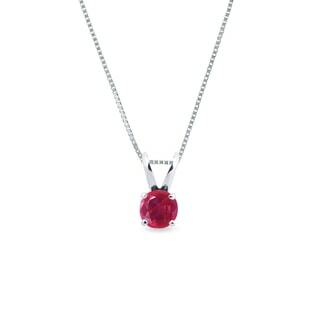 Rubies are characterized by their glassy luster, white streak, and good thermal conductivity. We can find them as hexagonal prisms in nature (they crystallize in a hexagonal system). Most commonly, they occur in pegmatite rocks, gneiss, marble, or volcanic rocks. They can be damaged by hydrogen fluoride or hot phosphoric acid and sulfuric acid. The most precious rubies are the bright red ones. In stores, these rubies are called pigeon’s blood rubies. Burmese rubies can have a slight fluorescence in visible light. These gems look good on any woman, as they combine elegance with passion. 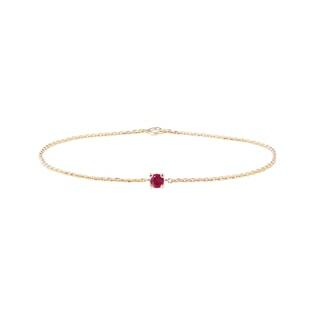 Rubies in yellow gold have a nice, warm look. With white gold, their color stands out thanks to the greater contrast. They also look great in combination with pure diamonds. These jewels are true luxury, and thanks to modern KLENOTA designs, women of any age will look radiant. The traditional oval or round cut is a good choice. An interesting and original alternative would be drop-shaped or marquise cuts. Raspberry or rubies with pinker color look fresh and cheerful. For example, these stones look great in a necklace or a ring on a young lady. They’re the perfect gifts for recent high school or college graduates. Jewelry with pink rubies is also beautiful and a very symbolic gift for the occasion of the birth of a baby girl. An indisputable advantage of the ruby is that it does not lose its luster. It can even withstand a swim in the sea. However, you should be more careful with regard to the fragility of the stone. Rubies might have cracks and inclusions, and therefore they can’t withstand pressure and temperature shocks as well. Rubies, as well as other gemstones, can undergo treatment to get a better color and to be better integrated. They are heat-treated, and the stones are exposed to higher temperatures. Flaws in the stone can be sealed with red glass. However, artificial rubies can also be made. 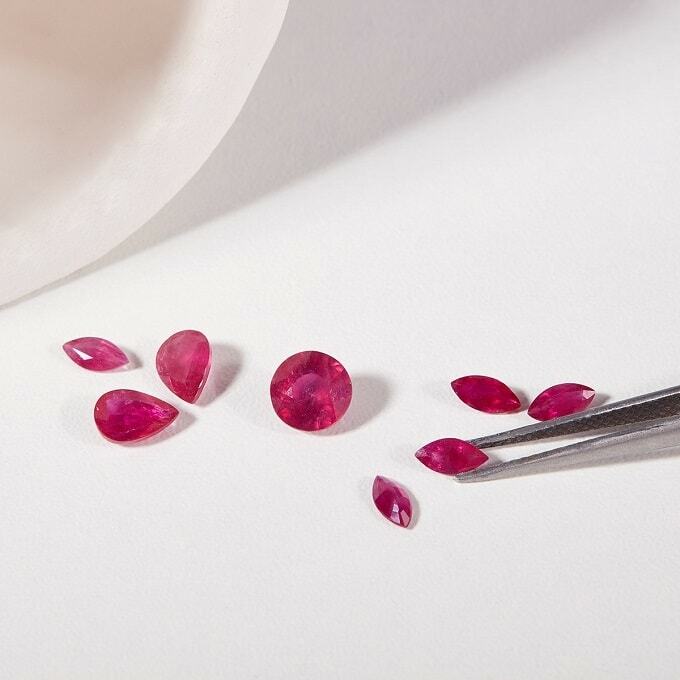 Synthetic stones come into existence in labs using the so-called Verneuil process, in which the ruby grows from melt and a ruby prism comes into existence. The first successfully synthesized ruby was made in 1902. They can be differentiated from natural rubies thanks to the line of color inhomogeneities which are contained in synthetic pieces. Other methods of ruby synthesizing are the so-called flux method and the Czochralski process. Rubies are made in all three ways, and they have the same properties as natural rubies. Rubies are very similar to garnets or rubellites, which sometimes get mistaken for them. A garnet is a colorful variety of tourmaline, which is not as valuable as real natural rubies. In our atelier, you will receive the Certificate of Authenticity for each jewel for free, so you know exactly what type of gem you buy. In Burma, rubies began being mined in the 6th century, which is documented in written records. Some sources even date the beginning of mining back to the Bronze Age. Pigeon’s blood rubies with a slightly blue undertone come from there. Rubies from Sri Lanka often have the color of raspberries, and we can observe asterism (the so-called star effect) in them. These deposits are also very old, and their history goes back to approximately 3,000 years ago. Other significant deposits are in Tanzania, Vietnam, Afghanistan, Cambodia, India, Thailand, and Madagascar. We can find many large rubies in the Czech Crown of Saint Wenceslas. However, there are speculations these days that the stones might rather be rubellites. The largest ruby in the world is called the Liberty Bell Ruby, and it weighs 8,500 ct (3.7 lb!). It really is a record-breaking stone with its 80 x 140 mm measurements.